Go through your comic books and look for superhero faces, speech bubbles that you like and of course, those ever famous sound effect words! Place an acrylic shape over the part you want to use and trace around it. Keep each one together so that you know which one goes with which! When you cut out the pieces, cut inside the tracing lines a bit so that they fit neatly on the back of the acrylic shape. Apply a thin layer of Mod Podge to the FRONT of the comic book cut-out. Press it to the BACK of the acrylic shape. If you need to reposition it, do it right away. it will start to dry pretty quickly. Be sure to press firmly to make sure there's no air bubbles. Add a little dollop of Mod Podge to a magnet and press it firmly to the back of the acrylic. Let them dry completely before using. 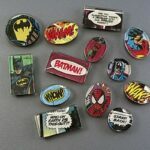 This project for Superhero Comic Book Magnets was printed from CraftsbyAmanda.com - https://craftsbyamanda.com/superhero-comic-book-magnets/ and can only be printed for education or personal use.